GrowFest! was the place to be for plant lovers last weekend! 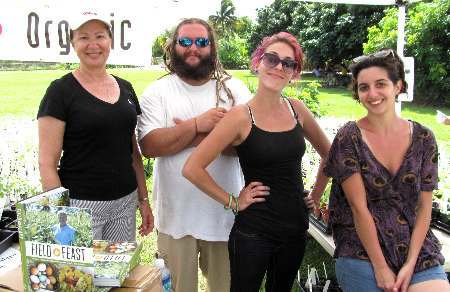 Over 850 adults, plus lots of kids, came to the first-ever event held at the Fruit and Spice Park in Redland. 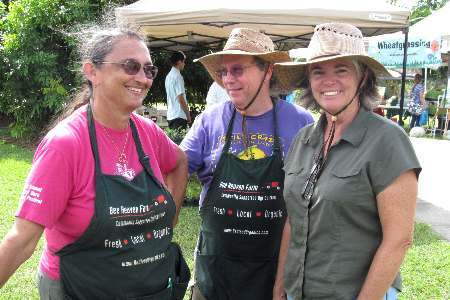 Festival organizer Margie Pikarsky of Bee Heaven Farm was thrilled with the turnout. “It was an unqualified success!” she exclaimed. Over 500 visited just on Saturday alone, exceeding her expectations. She promised that GrowFest will be an annual event at the Park. GrowFest! 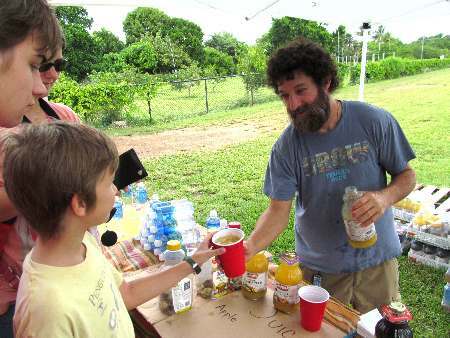 was a grassroots fundraiser for Florida Organic Growers (FOG), which received money from the gate, as well as proceeds from sales of juice and water at their tent. “We raised over $900 for FOG from ticket and raffle sales,” Margie told me. Executive director Marty Mesh was at the event, manning their tent, and answering questions at the screening of their documentary “What’s Organic About Organic” on both days. If you missed your chance see the movie or buy a copy of the DVD, you can order it from the filmmmaker’s web site. 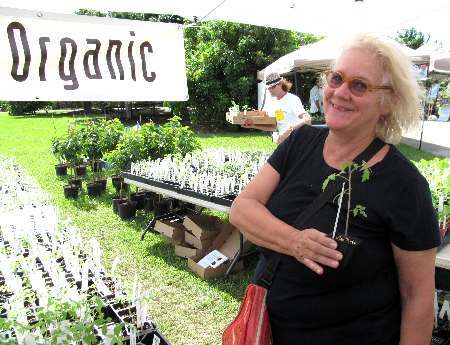 “FOG is the non-profit that certifies organic growers in Florida, and also provides education and outreach to growers, consumers, and policy makers,” Marty explained. Marty Mesh poured local Lakewood Organics juices at the FOG tent. The heart of GrowFest! was all about plants. And there were all kinds to choose from — vegetable seedlings, potted herbs, banana plants and avocado trees, and more. On Saturday morning, I volunteered at the Bee Heaven Farm/Redland Organics tent, and found myself surrounded by baby plants. 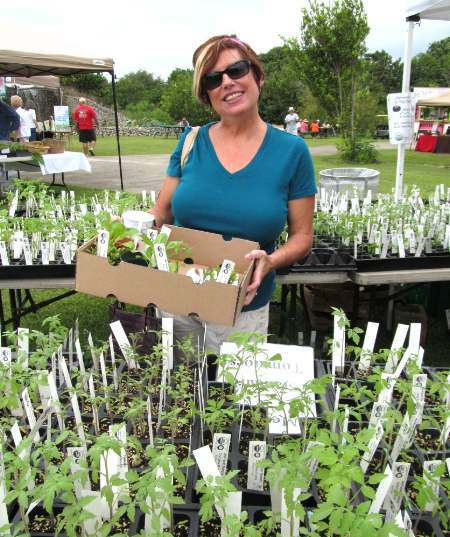 Long tables were loaded with over 80 varieties of organic heirloom tomato seedlings, several varieties of eggplant, hot peppers, arugula, nasturtiums, Asian greens and perennial herbs like garlic chives, curryleaf, aloe and lemongrass. Farm helper Victor and his wife Ish, and volunteers Nicole and Holly were also there to assist. Volunteers at the Bee Heaven Farm tent (L to R): Holly Victor, Ish and Nicole. Lots of people came to buy seedlings, and it was fun talking to them about their gardens. Most were regulars from past seasons who knew exactly what they wanted. The very first shopper was a tall man with a cart who loaded up with over two dozen plants. He said he saved seeds from his tomatoes from the year before, and was back this year to try new varieties. Soon after, Melodee Rodriguez, a dedicated mom who is in charge of the edible garden at Coconut Grove Elementary School, came with a checklist of vegetables and herbs for her school’s garden, which had been put in by Slow Food Miami three years before. La Diva herself, Laura Lafata, with heirloom tomato seedlings. Two other growers also had their plants for sale at the Bee Heaven area. Arturo Gonzalez of Sunshine Organic Farms was selling three varieties of avocado trees — Donnie, Simmonds and Catalina. (His farm provided grape tomatoes and a variety of vegetables for the Bee Heaven Farm CSA last season.) Organic growers Bill and Thi Squire provided lots of napa cabbage and two kinds of bok choy seedlings. The event’s poster child Beth Dunlop came to pick out several kinds of black tomatoes. 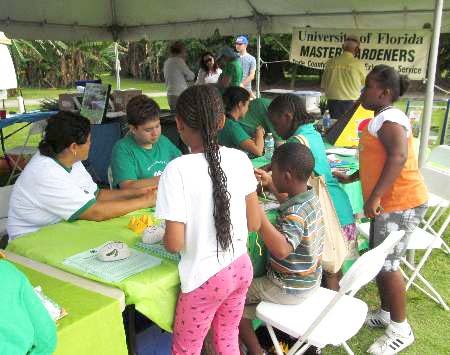 In a big blue tent by the front of the park, Master Gardeners from Miami-Dade Extension were on hand to answer gardeners’ questions about plant problems. Other staffers gave a demo on how to use rain barrels, and the 4-H Kids Zone was set up where kids could play and learn about plants. The Dade County Farm Bureau tent did fun things with kids, based on Ag in the Classroom materials. Kids hanging out at the Farm Bureau tent. The villain of the event was the exotic and invasive Giant African Land Snail (GALS). The ravenous creatures are a serious threat because they’ll eat almost any kind of plant, and even gnaw on the stucco on your house. 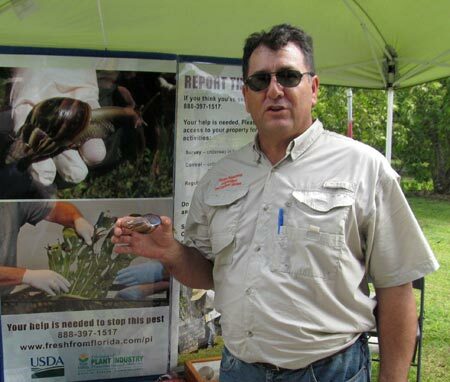 Several people from the state Division of Plant Industry were on hand with empty shells to examine (no live snails! ), and had lots of information about the imported pest. A fully grown snail shell was quite pretty, smooth and shiny with brown and white stripes, and was almost the length of my hand. Don’t think of touching live GALS without gloves on because they can carry meningitis and a parasite called rat lungworm. If you see a GALS in your yard, call 888-397-1517 to report it. Over 78,000 GALS have been caught just in the past year. DPI Ag Tech Omar Garcia holds up the shell of a fully grown Giant African Land Snail. Be on the lookout! Ann Schmidt (left), the hardest-working volunteer of them all, at the front gate. 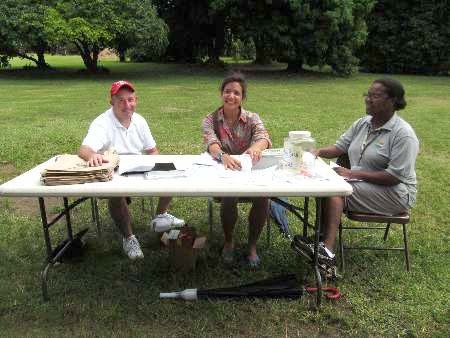 Mike Moskos (left) volunteering at the entrance table. 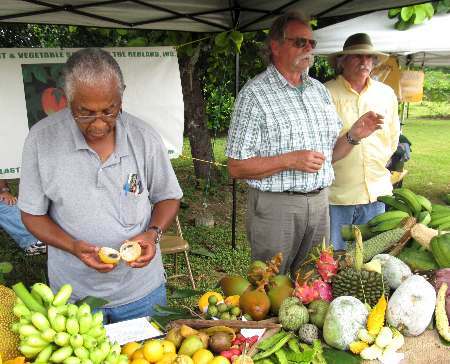 Fruit and Spice Park manager Chris Rollins (center) answered visitors’ questions about tropical fruits. The birth of a great South Florida event. I so wish I hadn’t been busy with other commitments last weekend! I’d have loved to have gone (and was at another, similar festival this weekend that was a TOTAL bust!). 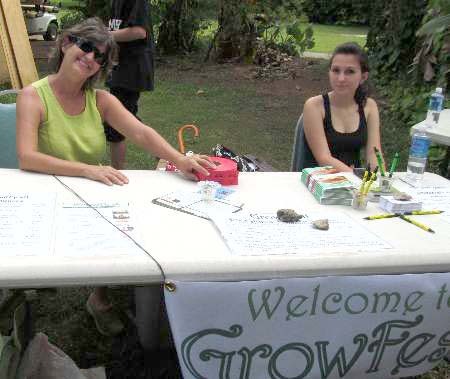 GrowFest was a who’s who of South Florida local food movement. Congratulations to everyone involved — truly a thoughtful, informative and fun event to kick off our growing season.